In November 2006, on the last day of the Montessori Peace Academy conference, twenty Montessori educators met with Ariane in a brainstorming session to decide on the next steps needed to bring this movement forward into the Montessori schools. We decided that our goal would be to build at least one water source in the Azawak in the name of Montessori schools worldwide. This blog began in order to facilitate that effort - to connect schools and students, share ideas, and report on the progress of the project. 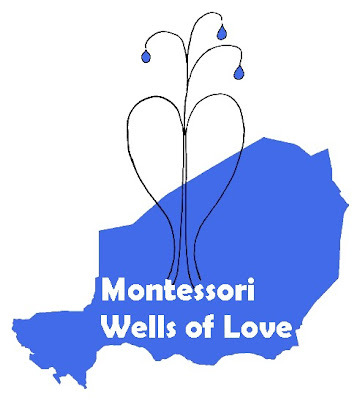 Now, we have named our partnership with Amman Imman: Montessori Wells of Love. Maureen Keeling from Odyssey Montessori School in Fredericksburg, Virginia describes how that name came about: "Because of the love Ariane feels for the people of the Azawak, and also because the wells filling with water will contain the love from all the Montessori students and their families world wide." We invite you to join our Montessori Wells of Love as we reach out with love to our brothers and sisters in the Azawak. I think this is a great idea and I will give lots of time into this! I have been doing things like collecting money for diferant charity.I have always wanted to particapate in something much bigger!! Thank you for your willingness to help. I look forward to hearing from you and sharing your stories here on the blog!